There has been a lot of buzz lately about the alarmingly high percentage of actively disengaged employees in the workforce. There are many factors that affect employee engagement – job fit, company culture and manager / employee relationship to name a few. When I reflect on my own career and the times I felt more or less engaged, I wonder if the widespread lack of employee satisfaction has more to do with a deeper disconnect between the DNA of a corporation and the DNA of a human being. I had the fortune of working for two very successful medical software / services startups before starting Keyhubs. Their paths, milestones and turning-points were uncannily similar. Both companies were founded by passionate academicians-turned-entrepreneurs, intent on changing the practice of medicine through the use of innovative software technology. The early days of each company were marked by an entrepreneurial and innovative spirit. The founders were relentless in solving problems, delighting customers and outlining a broad and far-reaching vision. Both companies went public and were worth half a billion dollars at their peak. While these companies made significant contributions to their field and became leaders in their respective domains, there was a distinct change in culture that occurred during my tenure, at both firms, that adversely affected my level of engagement. Forced to answer to Wall Street, the entrepreneurial spirit began to wane. This spirit died a symbolic death when both founders were effectively sidelined, despite the research suggesting that founder-led firms do better. Both ended up departing the companies they started. As time progressed, and especially after the founder departures, these organizations went from being companies with vision, passion and purpose to firms that only cared (or so it seemed) about next quarter’s financial results and what that might do to their valuation. The new leadership culture was intent on taking what had already been created and leveraging it as much as they could. There was very little place for creative experimentation or innovation – a phenomenon shared by countless post-IPO companies. Unsurprisingly, this was followed by a marked decline and / or stagnation in revenue. Both companies were acquired shortly thereafter at a fraction of their worth during their peaks. These stories remind us that even when you work for a business that is “doing well by doing good”, it is easy for the culture to become dominated by the money motive, especially if those companies are controlled by outside investors. After all, that is, more often than not, the only reason investors are at the table. While the DNA of a corporation is to maximize shareholder value, employees – the resource investors are depending on for an ROI – need more. As human beings, we seek meaning and values. We live for, and thrive on making a difference. Once we have enough to cover our basic necessities, money contributes very little to our well-being and satisfaction. Ever watch this presentation? Are you familiar with the Top 5 career regrets? Regrets of the dying? What about this 75 year Harvard study on what makes for a fulfilling life? The fabric of what makes humans happy is at odds with the very reason that many businesses exist. If that is not a recipe for active disengagement, I don’t know what is. Don’t get me wrong. Businesses should make money. They should prosper. Yes, money is necessary to survive, grow and innovate. However, when that motive becomes the primary driving force of the business, you lose employees, if not physically, emotionally. If you lose them emotionally, you begin to sow the seeds of active disengagement. 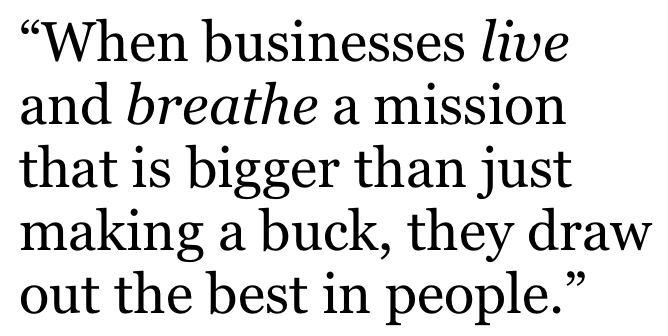 When businesses live and breathe a mission that is bigger than just making a buck, they draw out the best in people and significantly increase their chances of long-term success. There are many awesome, inspiring examples. Look at how Salesforce.com built meaning and purpose into their DNA from the beginning. 3M is legendary because they have maintained an entrepreneurial spirit even in the face of becoming a large, publicly held company. Their ability to innovate, decade after decade, is the subject of many books, articles and case studies. Google, Apple and Tesla are other obvious examples. One of my favorites is Southwest Airlines. They chose a ticker symbol that represents their most important core value: LUV. As leaders trying to grow a business and engage employees, we need to think about why our businesses exist and what kind of message we are giving employees. Are we starting and ending with purpose and passion or gravitating to, and celebrating, only financial outcomes? If we are to have engaged employees, do we need to alter the DNA of business to align more with the DNA of human beings? Do we need to harmonize the spirit of commerce with the almighty human Spirit? I agree Vikas, the congruency between our values and those of the organization is key to engagement. The question becomes…as the organization and the individuals grow, change, develop…how do we re create/ re new this alignment? Can we always expect it to be true? Or is it simply that It is like any other relationship where it just simply takes two to tango? Thank you for your thought-provoking questions! My experience has been that when companies grow, go public, change leadership, etc., their values end up changing. In my case, the companies migrated from purpose-driven to money-only, from innovation to stagnation. That was a “dance” I didn’t want to do after some point, as the organization turned into something I no longer recognized. The other companies referenced in the blog (Salesforce, 3M, Southwest), which have found a way to preserve their values (or expanded them to align with the deepest values of the human spirit) have outlasted most and continue to thrive even while their competitors falter. It definitely takes two to tango, but leadership is going to step on toes and scare employees away if they want to dance only for superficial, material reasons. Thank you again for your comments and I look forward to getting your thoughts / reflections / experiences. P.S. Godspeed to San Fran! Great post, a realization that well expressed in a well balanced way. Thank you so much for the kind feedback and sharing with your FB friends…means a lot. I am so glad we are still connected after all these years. Thanks for sharing these thoughts Vikas. I’ve had the pleasure of avoiding public companies so far and your post makes me wonder why more budding entrepreneurs don’t try out business models that allow them to preserve their entrepreneurial and purpose-driven spirit. Do you see any correlations between employee engagement and non-public business models (co-op, non-profit, private, etc.)? Thanks for reading my blog! You ask a great question. Many entrepreneurs are motivated by the money. Many start businesses purely for the sake of making a quick buck. They often overlook the essential, long-term “purpose” of their venture. They already start thinking “exit” before they even start! You should check out my other recent post: http://www.keyhubs.com/blog/hobbies-are-underrated-the-case-for-heart-centered-entrepreneurship/. Great post! In this selfish world we cannot expect people to be other than running after money or power or some ego trip. Having said that, few people are realizing the drawbacks of such a system and are changing. Some times nature supports the move with ease, some times it looks hard. I am happy every time I see a post from you. Humans have forgotten that one can be happy, and satisfied with less. There is nothing so great about making it big (with the idea to prove that one is better than the others) besides ego satisfaction, some people might say what’s wrong in it but however much it is quoted with sugar its still done with a bad taste (making it big with …blah blah). Always good to hear from you – thank you for reading my blog.